Over at Carbon Limited, Casey Cole calls us built environment commentators to arms over the government’s zero carbon consultation, downloadable here. This consultation is a biggie, writes Casey, and I think he’s right. So let’s big it up and let the government know what we think before the consultation closes on March 18. I intend to dip into this subject over the coming weeks, partly to do it in digestible chunks, and partly to give me a little more time to collect my thoughts about it. Initial feelings are not positive. Government housing policy is a mess. In the past few years they have pushed three objectives, all of which look pretty flawed to me. • Let’s build 3 million new homes by 2020. This target looks increasingly bizarre in the light of the credit crunch. At this point in time, builders can’t sell new homes for love nor money and the justification for all this new housebuilding — which was that we are suffering from a housing shortage — now looks like yet another bellow used to fan the housing bubble. The government clings to the hope that this slowdown is a temporary blip and that normal conditions will return in a year or two. Normal for them means house prices rising again and people clammering to get on the housing ladder once more. I’m just not sure anymore. OK, it’s only my opinion, but I don’t think we are going to return to the status quo ante. I don’t think we’ll ever see house prices back at 2007 levels. Or at least we won’t unless the government deliberately lets inflation out of the bag and devalues money, which is something else that worries me, but not something I am going to go into any more detail about here. I think essentially that we’ve now finished building Britain, at last for a generation. Just as our road building programme came to a halt back in the 1990s, our house (and commercial) building era is now probably over, save for a few choice infills and lots of replacements; that sort of thing. I think the big plc housebuilders are dinosaurs, relicts from the era of unsustainable growth, and that they will all be out of business within two years. And I suspect that building land prices will carry on falling back towards agricultural land prices, where they once were. Back before the days of planning permission. So there really isn’t a lot of point worrying about whether homes built after 2016 will be zero carbon or not because we will be building so few of them that it makes sod all difference. But there is no box anywhere in the consultation for people who feel like this. Lord knows, I have been on the attack against this absurd idea for yonks now, and I have now grown slightly bored of the whole topic, as has everyone else, by the looks of things. The eco-town proposal is now dead in the water, the credit crunch driving the final nail right through the heart. You’d think the government would be happy to shelve the whole thing if only to spare their own blushes, but no, they cling on desperately. Eco-towns even gets a page (p21) devoted to them in the zero carbon consultation paper. Why? Conceived in a blaze of publicity, back in 2006 when the Code for Sustainable Homes was published, this too has always looked to me to be an ambition with zero sense. Building super energy efficient homes is one thing; turning them all into mini-power stations quite another. You can imagine this project coming out of some think tank or other, a minister or two then thinking, “that sounds like a great idea”, the Treasury then commenting “even better, we won’t have to pay a penny towards it” and, hey presto, it’s a policy. And, ever since, good people have been scratching their heads, wondering just how on earth they are going to implement it. This consultation document, which Casey is pointing us towards, is the summation of all this head scratching. All 111 pages of it. If it really was a good idea, it would be very simple and easy to summarise on a single page of A4, so that every builder in the land could easily grasp what it’s all about. The very fact that there is a 111-page consultation about the definition of zero carbon shows that something is wrong with this whole project. But there is no box anywhere in the consultation for people who feel like this either. Green Building Guides? Or Blacklists? All of a sudden, Green Building Guides are in the news. 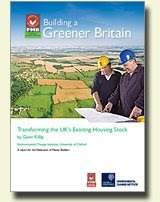 Specifically, the BRE’s Green Guide, which is used for Code for Sustainable Homes ratings. One the one hand, the BRE itself is reported as saying that councils, specifically Milton Keynes, are guilty of insisting that all new homes have A+ ratings, which was never the original intention of the guide. Whilst at the same time, the Good Homes Alliance is insisting that the BRE guide is deeply flawed, principally because it allows some uPVC windows to score an A rating. What are we to make of this? Personally, I really despise the whole idea behind Green Building Materials guides. I think it’s just blacklisting by any other name. If you don’t like uPVC, then just don’t specify it, but why try to stop other people using it? If the process of manufacturing uPVC is deemed to be too damaging to the environment, then it should be dealt with by legislation, not by blacklisting, especially if that blacklist then becomes enshrined within the building regulations via such devices as the Code for Sustainable Homes. The problem here is that the whole field is just rife with subjectivity and prejudice, and however well intentioned bodies like the BRE set out to be, they will never please everyone. But what really gets my craw here is not that the Green Building Guide is flawed, but that its very existence serves to encourage checkbox design, which is just what Milton Keynes have been indulging in. How about letting building designers use their own judgment about which materials to use? For many years, I have helped out on the Ask The Experts stand at the Homebuilding & Renovating shows, which are held at various venues across the country. We work as a small team (usually about six of us) and we advertise ourselves as offering independent advice. It’s also a very useful exercise for us as working journalists in that we informally monitor the questions being fired at us, and this gives us good feedback on what issues are of concern to selfbuilders. Besides the ever-popular planning questions, for the last two years the main question has been “How should I heat my house?” A jolly good question it is too, and one which has no clear answer. The main area of worry here is the package build suppliers, where deposits of tens of thousands are often requested, but it also came up in relation to a kitchen supplier and a window manufacturer. Many of these companies have built their business models on getting upfront payments and many have good reason to charge a large deposit, as the work about to be undertaken is usually specific to the individual contract and would be almost valueless if the client were to default. For instance, between 70% and 80% of the work carried out on a timber frame kit is value added by the manufacturer — the timber itself is rarely more than 20% of the final bill. The unofficial line that we adopt (and we have as a group discussed it) is to suggest that, if the client is at all concerned, then they should insist on their funds being placed in a third party or clients’ account, also know as an escrow account. This would be run by a solicitor or a bank, and the deposit would stay there until the goods are delivered to site. In theory, it sounds fine, but in practice very few firms actually offer such a facility. The main reason is surely that just by mentioning it, the seed of doubt gets sown: it makes people think about the security of their deposit and that alone maybe enough to scare them away. It’s that confidence thing. In addition to this, escrow accounts are costly and time consuming to administer and once people start thinking about them, they tend to want to start adding additional clauses, such as quality audits and time penalties. You can see just why manufacturers don’t like them. And yet, such is the severity of the downturn in construction that customers are focussed on security in a way they haven’t been before. Construction-related businesses are getting squeezed. In truth, many of the ones which primarily deal with the selfbuild market seem to be weathering the storm quite well — the selfbuild market isn’t exactly thriving but it certainly hasn’t ground to a halt either — but how is a customer to know what businesses the supplier normally sells to and what it is like for any individual company at any given moment? Again, it’s that confidence thing that’s so important. The problem for the deposit-taking suppliers is that confidence in their businesses may just seep away, even if they continue to trade well. Potential customers may just assess the whole sector as being too risky and decide to postpone their project, or chose build methods which can be entirely funded in arrears. An industry-wide deposit guarantee scheme might have helped, but no such thing exists for package build and it’s probably too late to organise such a thing now, at least as far as this recession goes. A more realistic option is for individual companies to reduce the size of the deposits requested (be they via escrow accounts or not), or even to go ahead on contracts without deposits. So my advice consisted of the following. Firstly, be aware of the issue surrounding deposits; don’t be afraid to mention it to the potential suppliers and to express your concern that your deposit might not be safe. Ask them what they can do to address your fears. If you like the product and the company, and you are tempted to go ahead with them, then by all means use the deposit as a negotiating tool. But do bear in mind that just as customers are ultra wary of paying out large deposits at the moment, so businesses are worried about delinquent customers as well. It might help matters if you, as a customer, could demonstrate your ability to pay before getting too clever with discounted deposits. It’s all about confidence, but that cuts both ways. On the way back from the Homebuilding & Renovating show, I pop into a development of near Passive Houses in Chewton Mendip. There I meet the project manager Arthur Bland who shows me around the terrace of three houses, which have been commissioned by the Waldegrave estate and are going to be rented out on completion. There were problems with the site. For a start, building control had identified a radon issue, which had to be managed. Arthur chose to use Eco Slab which, he said, was a brilliant solution, very easy to use and no mechanical handling required and, because it gives a ventilated sub-slab, all it needed was a gas barrier installed above to meet the requirements. Arthur also went for a poured Quad Lock intermediate floor, specifically to increase thermal mass — there is a hell of a lot of concrete in these homes. All around, the fabric is designed to have U values equivalent to Passivhaus standards, with extra insulation added where the proprietary systems didn’t quite get there. I had been told that these were another example of no heat homes, but it transpired that this wasn’t really true. What they did each have in their airing cupboards was £6,000 worth of Genvex Combi, a bit of kit I hadn’t come across before. This machine is a hybrid between a mechanical ventilation unit with heat recovery (MVHR), and an air source heat pump (ASHP), which also supplies 185litres of domestic hot water. It’s a beast, but it’s a quiet beast. One of the oft-heard criticisms of ASHP is that it is noisy, but these units ran with a barely discernable hum at the standard setting. Even on full blast setting, it made less noise than a gas boiler. It’s a neat idea. On the other hand, it’s electric heating, which doesn’t sound too great an idea. But to be fair, this is also pretty close to the standard set up in a German Passivhaus, where they usually have something called a post-heater added to the MVHR system. Arthur said that without the unit on, the houses were settling at an internal temperature of around 12°C (it’s been fairly chilly recently), but when I visited they were holding a temperature of 17°C. None were yet occupied. What I don’t yet know is how much energy these machines are using, though Arthur promises to let me know when he has some figures. I joined a throng of about 250 people gathered last night in central London to hear a 40 minute lecture by Wolfgang Feist, Mr Passivhaus. In the obscurantist world of energy efficient building design, Feist is the nearest thing you will get to a superstar and this was the first time he had spoken in public in the UK. He spoke in excellent English and held the stage with his presentation, although in truth, for those who already know about the Passivhaus movement, there wasn’t anything particularly new to be gleaned. In any event, he was preaching to the converted, although in the bar afterwards it was suggested to me that I wasn’t wholly on board. Oh dear, what is it with me? A few snippets I did glean. Feist and his family actually live in the oft-photographed original Passivhaus terrace built in Darmstadt in 1991. This is where the story started. His average energy consumption for space heating in this house is just 9kWh/m2/a; the Passivhaus standard is 15kWh/m2/a. In fact he showed a fascinating slide showing that though 15kWh/m2/a is the hoped for energy consumption in a Passivhaus, the range of outcomes measured at 32 Passivhauses on an estate in Hanover was between 4kWh/m2/a and 25kWh/m2/a. “if people like to keep the internal room temepartures at 25°C, then the energy use is going to be high. But then it’s still going to be much lower than on conventional homes.” He showed that such a range of outcomes was fairly typical across any group of homes studied. He also said he was proud of the fact that were now over 40 Passiv Schools in Germany: schools of course help to disseminate the principles of low energy design because they are used by so many people. Finally, he invited everyone to the next PassivHaus annual conference in Frankfurt in April 17/18 next year. The talk was put on by the AECB, who also used the spot to promote their CarbonLite standard which is closely based on PassivHaus principles. What wasn’t explained was why the AECB should be supporting a different standard. Perhaps it will all become clearer to me in time. Remember the 3 million new homes that were needed by 2020? It wasn’t so long ago that this target was being spoken about seriously. Well, today a study by AA Insurance has found that a) 70% of UK homeowners have never had a lodger, but b) that 20% of these are now considering it. At least I think that’s what the figures mean. Let’s assume this is so. There are around 25 million homes in the UK. So 70% of this is 17 million, give or take. Now if 20% of these 17 million (that’s 3.5million) are now actively thinking of taking a lodger, that will create 3.5million new bedrooms. That’s probably not far short of the number of bedrooms built in creating 3 million homes, as around 90% of these were envisaged as being rabbit-hutch style singleton flats. So the credit crunch appears to have solved the housing shortage already, without so much as a brick having been laid. And all within 12 months. This is me at the Harrogate Homebuilding & Renovating show standing on an Eco Slab. What is an Eco Slab? Well, I hadn’t seen one before but the fact that it was being demonstrated on the stand of Logix, one of our best known ICF suppliers, gives you a clue. Because what ICFs are to walls (i.e polystyrene moulds), Eco Slabs are to floors. • You then pour a re-inforced concrete slab. The thicker the concrete, the wider the achievable span. Will it catch on? I’m not sure. What you end up with is a hybrid which is not quite a solid slab (because there is air beneath the eco slab) and yet not quite a suspended floor (because the legs of the eco slabs rest on the ground). Does it require ventilation, as a suspended floor would? Not sure. And if not, then why not just build a solid slab? Off to the website to find out more but the website just shows up as a blank page in all my browsers, which doesn’t inspire confidence in the company behind it. But it certainly supports a 15 stone blogger, and his Costa Coffee latte. Interesting conversation last night with Anna Stanford, head of communications at RES, who I met at the Inbuilt birthday party last night. RES are behind the Wadlow windfarm development, which is local to me and which had been stalled in interminable planning negotiations. I asked her why RES didn’t offer some sort of financial inducement to the locals in order to get them onside. She said it was not possible because it would be regarded as bribery: the planning system expressly forbids it — or at least I think that was the gist of what she was saying. Technically, it would be feasible, for a 13 unit windfarm, such as the Wadlow one, would produce far more power than the surrounding parishes would ever need, and the financial model would still stack up because wind energy, albeit in its subsidised form, is very profitable and it would still be profitable if, say, 10% of the profit, or the power drawn from one of the turbines, was used to pay the electricity bills of homes within a mile or so. There are various models you could work on to make it fair: for instance if you were within 1000m, you would get all your electricity paid for up to a certain amount, and if you were within 2000m you would get 50%. And so on. That way the community wouldn’t just have a windfarm dumped on them, which is what the system demands at present, but rather it could sell its wind energy potential on the open market. The reason this can’t be done essentially boils down to a problem with definitions of ownership. No one can own wind energy — it’s a common good. But surely if organisations like RES are able to obtain rights to harvest some of this energy, they should pay compensation to anyone that they might inconvenience along the way. All things being equal, most parishes would probably rather not pay host to a windfarm built on an industrial scale, so why shouldn’t the ones that do receive some benefit? 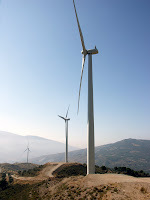 Meanwhile, here is an image of part of a wind farm I came across in Lanjaron in Spain two weeks ago. It’s located on the edge of the Sierra Nevada, easily visible on the road between Granada and the Med. Anyone who says a windfarm is an eyesore ought to go view this one: it is simply stunning. The road into Lanjaron weaves its way around numerous hairpins and it zigzags around several of the giant turbines. At one point you appear to be travelling through the blades themselves: they seem unbelievably close and powerful. For a brief moment, you can almost dream that the future may be benign afterall. I keep coming across this table on the Times website and then it keeps disappearing from view. Today I spotted it again on its Money Central site, so I thought I’d grab it and blog it, so that at least I can find it again when I next want to refer to it. It’s both very funny and very depressing — maybe a sign of the times. It suggests that there is no point bothering doing anything ever, as all it does is waste money. Just clean everything and keep the surfaces painted. Can things really be that bad? Where do these figures come from? 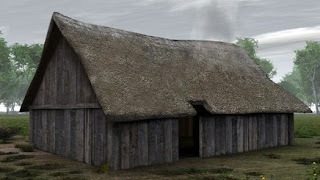 It seems the research was carried out by the Abbey and it was widely quoted during the summer by a variety of media — try keying abbey research home improvements into your search engine — but I can find nothing on any Abbey site. If anybody can point me at the original document, I’d appreciate it. More random thoughts on the Credit Crunch. This morning’s news that the government is buying huge stakes in RBS and HBOS seems like a very sensible idea, given the general air of panic that seems to have engulfed our financial system. Effectively, it says, these businesses cannot go bust and that money invested in them is gilt-edged. It also changes the way the market will be seen to work for the foreseeable future. If the government can take stakes in banks, why not lots of other ventures? And why not people’s homes? Suddenly a new vista opens up. Having spent much of the summer worrying about how to green the existing stock, and not really getting very far with my thoughts, now a new possibility rears its head. The government demands that every home must reduce its carbon emissions to a set level, to align itself with the requirement for a national reduction of 60% or whatever the goal is. An assessment of each house will be made (rather more thorough than our current EPCs), and a plan of remedial action drawn up. The homeowner is then free to carry out the works at their own cost, but if they cannot or will not pay, then the government will undertake the work anyway and, in exchange, take an equity stake in the house equivalent to the value of the work done. Various tax incentives will be made available to those who undertake the work quickly (such as lower council tax banding, stamp duty rebates, soft mortgage deals): or put another way, there will be penalties for those who have to be dragged kicking and screaming to the table. It would be a lengthy programme lasting maybe 25 years, which would mean doing a million homes a year. The building trade would be very busy. In fact, such is the level of work involved, that it could even be cast as a depression-busting New Deal. A month ago, this would have been politically unthinkable. The bank bail-out has changed that. Now shared ownership with the government can become an engine of transformation. Afterall, no one can say it’s too expensive. Whilst undertaking a speaking gig at the Grand Designs show on Friday, I stumbled across this, the latest innovation from the Zed Factory team, named in honour of their helmsman Bill Dunster. Or maybe not. Big pictures are made up of lots of little observations. That’s pretty much what’s happening with the credit crunch at the moment. No one really seems to have a complete understanding of why the markets are so gripped with panic, but gripped with panic they are. We are not about to go to war, there isn’t an asteroid about to impact, we aren’t all dying of plague, and Spurs have started the season with their customary flourish and lie bottom of the table. In fact, in many ways, it’s quite a normal autumn. So why are banks in Europe and America going down like ninepins? And why has the housing market come to a complete standstill? Here’s my fourpence worth. We have a big problem with land values. We’ve enjoyed (or some of us have) a 50 year bull market in building land which has caused a huge disparity between the value of ordinary land (i.e. designated as agricultural) and building land. Like, building land being around 250 times more expensive than fields. This is all because of planning restrictions, or what the Americans would call zoning. The value of building land has inflated slowly and steadily during this period, accelerating in the past fifteen years only. The point about this bubble is that it’s been so slow to inflate that people haven’t recognised it as a bubble. On the contrary, it’s been seen as being “as safe as houses”. And people have got very wealthy by buying building land (and the houses that sit on it) and just sitting there and watching the bubble inflate. And banks have lent bucket loads of money, secured against these inflated house prices. The more the land goes up in value, the more mortgages get repaid, the more money the banks had to lend to the next generation wanting to ride this gravy train. And the government in this country has stoked the fire by claiming that there is a housing shortage and that we have to build millions more houses in order to make them more affordable. There isn’t a housing shortage, any more than there is a road shortage, but if people say it loud enough and often enough, everyone gets drawn into the illusion. Everything has conspired to make this particular bubble seem very real and very permanent. And yet, and yet. Eventually something has to give. Eventually people started saying “enough is enough, I have better things to do with my life than pay 50% of everything I earn to service a mortgage for a crap house.” The worm started turning about four years ago. Just a few people, a trickle no more. It greatly affected the quieter districts of the country — it took me a year to sell a house in Norfolk back then. But then it spread. More and more people stopped believing in the inexorable rise of house prices and sometime last summer it tipped the balance and prices started falling across the board. The image that keeps coming to mind is the tide. All these deals which made sense when the tide was coming in no longer make sense now the tide is going out. They are left exposed on the beach, the loans that supported them looking naked and ashamed. That is why it’s the banks that are copping it, because a huge chunk of banking over the past 50 years has been based on property values. At the moment, it’s the banks that took on the riskier loans which look exposed, but if the tide keeps going out and prices keep falling, then the so-called safe loans, made at 70% of value, start to become exposed too. As long as property prices keep falling, then more and more bank loans will loose their security. This is why the banking system is now in crisis. The more conservative banks are best placed to ride through the storm, but ultimately all banks could be at risk if the storm doesn’t pass. So what we really need to bring back stability to the system is for house prices to stop falling. It doesn’t matter so much whether they fall by 15%, 30% or 43%, just so long as they stop falling. We can already see a pattern emerging. The governments around the world are moving in to bail out the distressed loans. As a result, they may well end up owning lots of houses that these loans have defaulted on. Private houses will become council houses, and mortgage defaulters may find themselves council house tenants. Afterall, it makes no sense to throw all these people out of their homes: you’d end up with a million homeless families and a million empty homes, so they might just as well stay put. There is a better solution to this crisis than buying up distressed debt. Instead of bailing out the banks that made these loans, the government could instead bail out the people who took on the loans and can no longer afford to service them. In effect, the government could and should become house buyers of last resort, so that if someone wants to sell a house and they can’t find any buyers, the government would have to take it off their hands at a reasonable price and then make it part of their council housing stock. The price paid for the house would have to reflect the rent achievable so that the government borrowing would be supportable. And the purchase could include a right-to-buy scheme so that in future the tenants could once again become property owners, should they wish. In effect, government intervention could set a floor on how far house prices will fall. Once we have a floor, then stability can return to the markets, the banking system will pick up again, builders will be able to dust off their toolbags and financial meltdown will be avoided. We’ll still have a nasty recession because the housing bubble is over for a long time to come, and there are all manner of businesses (the banks being a prime example) that have built their business models on ever increasing land values. But if we can at least stabilise house prices (and the government has the power to do this), then we can start to repair the damage that’s already been done. But it’s not going to happen until the government comes out of its state of denial about the nature of the housing crisis, and its fruitcake aim of building 3 million new homes by 2020. That is the sort of thinking that has caused this problem in the first place. I don’t know why no one has thought of this before, but it’s taken an innovative Hereford-based green oak builder, TJ Crump Oakwrights, to pioneer the concept in the UK. Not only have they constructed a showhouse, but they offer it for weekend lets to prospective customers as well. Now you can get to live the dream, even if it’s only for a couple of nights. Ever wondered what Lutron Homeworks is like to use? Or whether you can get to grips with MVHR? Or underfloor heating? Or a body shower? Or how a boiling water tap works? Or a whole house audio system? What are these big glazed gables like at night time when the stars are out? Or in the morning when the sun shines through? Or just what it’s like to pad about barefoot in a huge hallway, with cathedral ceilings? Seeing this stuff on tele and in magazines is one thing. Staying in a top of the range show house puts a whole new perspective on it. OK, I admit it, I was a guest. It was a favour in return for a speaking engagement at their open day. But I learned a lot and really enjoyed the weekend. Not surprisingly, the house is booked up months in advance. And also I am not surprised to find that here is a housebuilding business with a full order book. • You can choose to include or exclude a) feedstock energy, which is the energy embedded in plastics which might otherwise have been burned as oil and/or b) sequestered energy, which is energy locked into timber or plant matter which might have rotted or burnt if it hadn’t been used in a building. And this just covers the built environment. Leave that behind, and you move into the realm of ecological footprinting where everyone starts to talk in units of global hectares, which leads to the One Planet Living concepts. I came away with the impression that there an awful lot of academics out there beavering away at ever more complex algorithms, and that the rest of the world knows very little about any of it. The star of the show for me was Craig Jones, who works at Bath’s Sustainable Energy Research Unit. He is the man behind the Inventory of Carbon & Energy or ICE database, which is the only place I know of where you can look up embodied energy data on building materials, without having to pay for it. Craig is involved in analysing published data from a variety of sources around the world and trying to make sense of it for the UK market, and he and his boss Professor Geoff Hammond have decided to make the fruits of their research available online as a public resource. Consequently, it gets very widely referred to by sustainability consultants and used as the basis for a lot of buying decisions. In fact, one delegate told us that every single water company in the land now refers to ICE when specifying their future investment programmes. His logic for excluding sequestered CO2 wasn’t entirely convincing. What he said was that whilst it was true that using timber in buildings did effectively lock away carbon dioxide for the duration of the building’s life, he felt that there were still many unresolved issues with what happens to the large amounts of timber waste which doesn’t get used on site. He was happy to accept that it’s a contentious area. He did however admit that much of the timber data is sketchy and he relied on work done in North America, which puts the embodied energy of timber at a surprisingly high figure, mostly to do with the energy involved in kiln drying. I’ve read some of this stuff and have to say it gets bogged down on whether the kiln drying process uses fossil fuels or waste wood chips at the sawmill. Some sawmills do one thing, others do something else. You can see how this stuff ends up going around in circles. Despite all the problems, Craig (the IceMan) is now becoming identified as the UK’s repository of information on embodied energy, and all because he’s gone open source. A lesson here for others. He’s obviously put a huge amount of work into compiling the database and should be congratulated for creating so valuable a resource. What needs to be done now is some comparative studies of different construction methods using the ICE data as a reference. The London Homebuilding & Renovating show has been and gone. We could have chosen a better week. AIG failing, Lehman Bros failing, HBOS becoming a distress takeover for Lloyds TSB, stories of thousands of job cuts up and down the land: it doesn’t exactly inspire confidence in the housing market. It’s funny, but turmoil always seems to come in the second or third week in September. Despite all this, there were still many brave souls who made it to ExCel and I spent just as much time talking as ever, hearing some interesting stories along the way. One topic of conversation that kept coming up was the aforementioned changes to our Permitted Development Rights. Everyone at least seem to have heard about them, which I suppose shows that the government has at least got the message out that something is afoot. But in truth many of the show visitors thought that these PD Rights Thingies were being introduced for the first time as a major concession — i.e. they hadn’t realised that they have always existed and are simply being amended. I had an interesting conversation with Hugo Tugman of Architect Your Home who finessed me on some of the changes. One thing I hadn’t quite groked before is that the PD Rights for extensions and loft conversions have been separated, which is good news for lots of people. Before, you got 70m3 of extension out the back or of 50m3 of additional roofspace. If you used up 50m3 building a small extension, any roof changes you might later plan would require planning permission. That’s no longer the case. There’s an allowance for the extension AND the loft. However, there are lots of little fiddly bits which have crept in as well which need to be deconstructed. The roof extension can no longer be built up directly off the back wall, you now have to step it back 200mm from the eaves. Solar panels are acceptable without planning permission, provided they don’t protrude beyond 150mm above the roofline (they shouldn’t). Even more good news for Good Lifers is that garden buildings can now include hen houses, pigstys and beehives. I’m sure the neighbours will appreciate that one. Finally, there is something in here about off-street parking bays. You can still have them but if the area covered is greater than 5m2 (i.e. a very small car), then the materials have to be porous, or a soakaway has to be provided. So the much talked about revision of Permitted Development Rights arrived in our laptops last week, amid much talk about slashing the need for planning permission and the like. But when you actually get to look at the small print, there is precious little that has changed from the old version. It seems that the way of calculating how much extension you can build without applying from planning permission has switched from working it out in cubic metres to having maximum dimensions. And the net result is not really very different — it’s just a different way of working out the same thing. So much for a bonfire of the regulations. Last week, an august body known as Eurostat, made some rather bold predictions. Eurostat is the statistics office of the European Union and it took it upon itself to undertake some guesswork about what would happen to European populations over the next 50 years. Their published results are remarkable. Not in terms of the overall population of the 27 states making up the EU, which is set to increase from a current 495 million to 520 million by 2035 and thereafter to start declining to around 505 million by 2060. The remarkability concerns the population totals for individual countries which are hugely variable. Most of the relatively poor accession states will experience dramatic population declines, of between 18% (Poland) and 28% (Bulgaria). More surprising, Germany will loose 12 million people, 14% of its current population and cease to be the largest state within the EU. That rather weighty burden will be passed to the UK, which, it is anticipated, will grow from around 61 million today to 77 million in 2060. There doesn’t appear to be much in the way of supporting evidence for all this. The population changes have little to do with birth/death rates which will remain broadly neutral and a lot to do with patterns of migration. I can’t help thinking that what they have done is simply to have taken current trends and projected them forward far into the future. But this is a bit like saying because it’s windy today, it will still be windy in three weeks time. In other words, it’s all just guesswork, based on extrapolation of the near past into the far future. But then another thought occurs. In terms of planning and the built environment, population projection is fundamental. So maybe we should take it seriously. And then another thought. Why should we take this lying down? Who says we have to house 16 million extra people by 2060. Or Germany has to lose 12 million, or Bulgaria 2 million? Would it not be more sensible to pursue policies which encourage population stability? Why are we acting as though population is stuff that just happens to us and our job is to passively react to it? Then another subversive thought. An extra 16 million people in the UK equates to around 8 million new homes at current household formation rates. Divide that by 50 (for the number of years between now-ish and 2060) and you get 160,000 new houses a year, just about the amount we managed to build before the credit crunch had other ideas. Or, put another way, 8 million new homes is around a thousand eco towns of 8,000 homes apiece. Assuming that nearly all of these 16 million extra people would want to live in the South East, a region which measures approx 32,000 square miles (that’s 200 x 160), that means there would be nowhere south of Derby where you’d ever be more than six miles from an eco-town. That’s a comforting thought. But what worries me even more is what is going to happen to Germany in this Eurostat scenario, where there will be approximately six million empty homes. And thousands of kilometres of empty autobahns. And all those spiffingly fast trains with no one on them. Germany already has a built infrastructure capable of handling a population nearly double what it is now. For what purpose? As a manufacturing powerhouse, Germany in 2060 will be run by robots and Germans will be largely redundant. Has anyone asked them how they feel about this future? Has anyone asked us? I know it’s uncool to talk about optimal population levels, but without a population strategy, what is the point of having a planning system? That’s the sixth question mark in this blog entry: that’s enough for one evening. Further to my entry dated August 13, Becky from Wolseley has contacted me to say that they are going to have a Selfbuild Day there at the Sustainable Building Center in Leamington Spa on Saturday October 25th, 2008. The free event, which will run from 10am – 4pm, will enable self-builders to gain a great understanding of the latest sustainable products and technologies - from their system design and relevant applications, to efficiencies and payback. Wolseley’s self build account managers will be on hand alongside the SBC team and key suppliers to offer expert advice on the benefits of choosing an eco-friendly self-build project. To register for the event or to book an appointment with one of the experts to discuss your project in greater detail on the day, contact a member of the SBC team on 01926 705403 or email sbc@wolseley.co.uk. Yesterday I drove down to Cranleigh in Surrey to the home of Charles Brooking, the man who is famous for collecting historic windows. Our meeting had come about through a casual enquiry I had made to him about the origin of French windows and, more specifically, whether it’s correct to say French windows or French doors. According to Charles, it’s very definitely French windows: French doors is utterly non-U. The habit of fitting them arrived in Britain in the early 19th century and it does appear to have originated in France, where timber joinery practices were some way in advance of ours. Anyway, one thing led to another and yesterday morning I found myself entering the strange world of Charles Brooking and his enormous collection of joinery dating from the 1500s through to the 1960s. We immediately found out that we had much in common. Both of us were born in 1953, both of were sent to minor public schools and neither of us had done much that resembled a normal day’s work since. Whilst standing in one of the many sheds in his garden, leaning against some timber sash window he had salvaged from God knows where, he seemed very keen to talk me through some of the byways of his life and carreer, and how it has always come back to his fascination with architectural details. Charles claimed that this started for him as early as his 3rd birthday. It placed him really as a man out of his time. He seems to sit uneasily in a world of congestion charging, security cameras and internet banking. He talked wistfully of the fun and freedom of the 60s and 70s and said he didn’t regret not having any children because he thought they faced a grim future. Oh dear, maybe this recession business really is getting to people. The point about Charles Brooking is that he isn’t just some eccentric collector with a case of OCD: he ferrets out stuff with a purpose and is assembling a body of work, which is quite unique in the world. His work has come to the attention of many over the years, including such luminaries as Prince Charles, and he has for many years been employed by the University of Greenwich as a lecturer. His opinions are regularly sought out and a visit to his collection is a must for any aspiring conservation officer. But he has a problem. Collecting remains his passion, cataloguing his curse. The Brooking Collection in its entirety now includes over 300,000 pieces — he has over 30,000 sash pulley mechanisms alone. His phone is hot with new contacts ringing him up about country houses about to be demolished, and he feels that it’s important that someone (i.e. Charles himself) is around to sort the wheat from the chaff. But without some back-up and the hope that at least some of his collection can move to a permanent home where it could be curated and displayed, it may all end up lost in a series of sheds dotted around the countryside of Surrey and Kent. is currently going backwards in terms of visibility, if not in size. The University Of Greenwich offered to display some of his collection in 1986, but then sold the site used for this in 2002, since when its gone back to being warehoused. There are moves afoot by the University of Greenwich to set up a new permanent home for the collection, but it’s painstakingly slow and Charles fears that the whole process is losing momentum. To my mind, it seems ironic that, with all the interest displayed in this country towards conservation projects and with huge organisations around like the National Trust and English Heritage, there isn’t more help for Charles Brooking. We spend inordinate amounts of money on maintaining historic properties, but we actually have very limited resources for teaching people the history of our buildings and how and why they came to be built. Pulling these threads together systematically is a huge task and here is someone who has completed a large tranche of this work off his own batt. For which service, the conservation bodies largely ignore him. Tim Pollard is Wolseley’s Mr Sustainability. Here he is pictured yesterday outside his pride and joy, the £3m Sustainable Building Center, which opened in April this year at Wolseley’s UK HQ in Leamington Spa. He used to be head of marketing at Wolseley, owners of Plumb Center, Builder Center, Encon Insulation and Bathstore.com. But somewhere along the line, he got the green bug and saw a need to start promoting sustainability as a concept from within the Wolseley empire. Or, put another way, rather than just stocking what plumbers were asking for, offering them a choice of products they may not even have known existed, in the hope that they will one day (soon) cotton onto them. Due in large part to Pollard’s campaigning from within, Wolseley have invested heavily in sustainable building materials and show no sign of back tracking from this, despite the rotten trading conditions which have forced them to lay off thousands of staff. The deal with the board seems to be this: Pollard has identified 7,000 product lines (out of a total of 500,000), which can classed as sustainable. The relative sales of these product lines will be the yardstick by which the success of the SBC will be judged. The early indications are that the sustainable product lines are increasing their market share month on month. Just by adding Wolseley’s market presence, many otherwise marginal products become mainstream. Take wood pellets as a good example. Many people have shrunk away from installing expensive wood pellet boilers because of fears about continuity of supply. However, Wolseley have partnered with Jeld Wen to come up with a solution. Jeld Wen have lots of wood waste: Wolseley have the delivery capacity, so Jeld Wen have set up a wood pellet plant in Lowestoft and Wolseley now offer to deliver the output nationwide. The Sustainable Building Centre is all about education. It’s not a trade counter and it’s not even open to the public as an exhibition hall — it’s appointment only. Yet they have already taken 270 bookings for visits by various groups so it’s working at virtually full capacity. Inside you will see displays of everything from renewable and low carbon technologies, SUDS, green roofs, natural paints and floorcovers, LED lighting and low-flow shower heads. In fact, just about anything you could think of with the notable exception of micro-wind turbines, a particular bete noir of Tim Pollard. They plan to hold a number of selfbuild weekends and if you want to visit it might be an idea to check the website for more details, or make an enquiry at your local Wolseley Center. It’s a year since I last went to Upton, the much written about urban extension to Northampton. I called by again today to see how it’s developed. It was like a ghost town. Work on the new sections of the development has almost come to a standstill, and much of the finished housing lies empty. It must be very sad for the people working there, and not great for those who’ve already made their homes there in the hope that it would be nearly finished by now. The credit crunch has more or less left it high and dry. There is some very strange housing there and a lot of it is very ugly. None more so than an extraordinary development at the south western corner of the estate by David Wilson Homes, now part of Barratt. Just take a gawp at this showhouse: it really is an eyeful, and not in a good way. The reason I took this picture was to highlight the fact that the cedar shingles they have used for the cladding already look completely different on the west face than on the south face. But the camera I am using isn't quite up to the job of picking out the discolouration. However, it’s done an excellent job at highlighting just how bizarre it looks. Like almost everything else in Upton, it's been stretched upwards to get a third storey. Whilst this may make good use of the footprint, it just looks all out of proportion for a detached family house, which is what this is meant to be. And the windowless south face makes it look like a warehouse. Covered in shingles. My prediction is that the cedar shingles will have to be replaced within five years because they will look awful by then. There are places where they can look great, but this is not one of them. Around the corner, Dunster’s Zed homes are now nearly finished and were taking a last lick of paint. Despite it being fairly windy, the roof mounted wind turbines were barely spinning at all and the Dalek-like wind cowls seemed to be revolving in a near random fashion, though my photos shows the seven of them broadly aligned towards the breeze. All this roof-top wizardry gives the terrace a faintly toy-town feel which at least brings on a smile, and the proportions actually look very good, at least compared to many of the other developments. It really is a very weird place, Upton. If you want to see what an eco-town might look like, then take a visit. In fact take a visit even if you don’t want to see what an eco-town might look like. There’s something more than a little disturbing about the whole place and I can’t quite put my finger on it. And it’s 6000 years old! I’m not entirely sure what the eco-town challenge panel are up to at the moment, but if they want novel ideas on how an eco town can distinguish itself from any other housing development, how about demanding that the developers include a special ministerial back-pedalling cycle lane. The latest casualty of this scourge is none other than Caroline Flint who must by now be wishing she was minister of almost anything but housing. Her commitment to 10 eco towns has now slipped to “up to 10 eco towns” and that “over a period.” Like maybe 500 years, Caroline? OK, I admit, it’s slightly enjoyable watching these ministers wriggling on a hook of their own making. But how do you think the eco town challenge panel are feeling about all this? They were brought in as arbiters of taste and sustainability but are now looking like a bunch of patsies, having to defend the indefensible on behalf of a government that has cooked up a stinker of a proposal which nobody wants. Common guys and girls. If you really want to improve the environment, do the decent thing, resign in a blaze of publicity and help bring this whole nonsensical eco-town proposal down with it. C'mon Wayne. What you waiting for? On Friday last week, I went to visit Robert Bagnall, the man behind the wonderful 127a Church Street selfbuild diary. It’s the most warts-n-all tale I’ve yet come across and I only hope that his subbies read it. Somehow I think not. Robert has undertaken the full project management of this build and has undertaken a fair bit of the work himself. Although there are no ground breaking features which might excite TV shows or magazines, there are one or two details here that I hadn’t seen before and was interested to find out more about. In particular, Robert has chosen to fit Roofblock which I have known about for years — I first wrote about it in 1999 — but have never seen used on site before. Roofblock originates from a civil engineer in Northern Ireland called Andrew Schofield who saw an opportunity to simplify a building detail — roof edges — and to also make a maintenance-free component by making it out of concrete. I believe it sells in reasonable numbers in Ireland but it’s struggled to make much of an impression in Britain. Perhaps because it doesn’t look quite right? Or maybe not? You be the judge. What did Robert make of it? Well here are his comments sent in an email to me in April, and reproduced here with his permission. I’m surprised Roofblock isn’t used more widely. I can’t remember where or when I first heard of it, but I’m pretty sure I was aware of it before we started planning the build. I think your book clarified and put a name to what I’d seen previously – I certainly had an ‘oh, that’s what it’s called’ feeling when I’d read what you’d written about it. To be honest, I didn’t cost the wood or PVCu alternatives as using a single simple block between the top of the brick/blockwork and roof seemed intrinsically attractive. The cost, when I saw it, seemed reasonable. If it has cost a tad more we’ll have saved in terms of not having to go up three storeys to replace fascias (or do I mean soffits? or do I mean bargeboards? whatever). However, the maintenance-free aspect of the Roofblock is, however, slightly compromised by having to put a length of 4x1 on top of the Roofblock, below the slates, in order to kick the bottom row of slates up. On the one hand, you can’t see the wood, which is aesthetically preferable, but may mean that I won’t have any cosmetic signs that the wood’s rotten before we get bird infestation between the SIP & the slates. On the other, it meant that I didn’t have to drill holes in the Roofblock to attach the guttering – I would have felt very silly if one of the blocks had broken. The other attractive facet of using Roofblock was that the brickies could put it up themselves. And using SIPs for the roof meant that the chippies were almost redundant – apart from attaching roofplates and banging nails through the SIPs into the ridge beam and purlins we practically didn’t need a carpenter for that aspect of the build. (I’ve checked my final bill from the brickies to see how much labour cost and they’ve actually forgotten to charge for it separately – it wasn’t part of the plans when I got the original quote – so it’s just been absorbed under general brick & block work. The cost for the Roofblocks themselves was £1150 + VAT for about 45 linear metres of block). I don’t have a lot to say about the product – it does exactly what it says on the tin – but the installation is worth a few comments. Whilst the brickies hadn’t seen Roofblock before they were familiar with similar products. Apparently there’s an estate in Bedford built with similar blocks which also carried the guttering within them (they seemed to imply it was actually enclosed within the block rather than obscured by the block, so look out for the estate with the water damaged brick...) There was some ambiguity from the plans about how the block went around the corners and we had to talk to Andrew Schofield to clarify. Quite a bit of cutting is necessary around the corners as, understandably, Roofblock aren’t going to make bespoke blocks for your exact roof pitch, making the free labour look even more attractive. The mortar gaps between our blocks are, I think, quite wide and if anybody ever has the opportunity to look down the edge of them they’ll find they do wander about a bit. Not sure if the two are connected. From ground level it all looks fine (although, possibly, a bit bulky for some people’s taste). I’ve had a look at the Roofblock brochure to see if the blocks in the pictures are fitted flush to look like dressed blocks, but they have (thinner) mortar lines. Not sure if the nature of the block meant that it had to be that way or was the brickies’ preference. But, tellingly, we did end up with half a dozen or so blocks over. My one criticism of Roofblock would be connected to the information they’ve produced. The plans they drew up with the quote were quite rough, and there are few specifics on how to get the block to join up with any unusual roof construction. (Compared to, say, the SIP roof panel manufacturer who had a whole online catalogue of plans and drawings of how to use them in almost any circumstance). I had to do my own plans to show the brickies how Roofblock & SIP married up which I got checked by the building inspector. Overall, I’d use it again if it was in keeping with the design. On Friday night, I went to Hinxton Village Hall to have a look at the roadshow put on by the sponsors of Hanley Grange, our local eco town. ‘Twas a grim little affair. There were two blokes, one in a jacket and tie, the other with open necked-shirt, who had been placed there to field questions and basically get it in the neck. A few residents came and went and stared grimly at what the powers-that-be had in store for them. One or two voiced their anguish, most remained silent, looking at the six or seven display panels which had been erected around the village hall. Hinxton is the village closest to the proposed site — I have outlined it in red on the brochure — and the fact that the scheme is being sponsored by Tesco just seemed to add insult to injury. In fact so unpopular is the Hanley Grange proposal that I immediately started to feel sorry for the two guys put in there to answer questions — I sort of expected them to get lynched. I asked the guy in the open necked shirt whether they felt there was still a need for an eco town here, given that house prices are crashing and building sites suddenly seem as about as desirable as Anthrax dumps. That’s sure to make the proposals even more popular with the Aborginals of Hinxton. The numbers on the council house waiting list prove precisely nothing, as there is always going to be a demand for subsidised housing. The rationale behind the government’s housebuilding plans is that the demand for and price of new private housing can be used to siphon money into the subsidised sector, but the collapse of the new homes market has put pay to this ruse for the time being and, just possibly, for all time. I’m not sure the government realises this just yet, but sooner or later, it’s going to have to admit that this particular scam is now dead. What caught my eye was just how rushed and ill-prepared the proposal is. There’s been no time for any of that fancy masterplanning, or for anyone to work out just what infrastructure might be needed to move people and goods into, out of and around the new town. They’ve just taken an aerial view of the site and drawn a motley collection of houses, shops, schools and green spaces, plus a couple of lakes, to give an artists impression of what an eco-town might look like which is, surprise surprise, just like any other new town that’s ever been designed and built. Accompanying it was a list of ten proposals which will make this town green but frankly it’s a list that any group of reasonably bright Year 11’s could have come up with in about 15 minutes. It just looks like someone has been told to plonk a small town down in some fields between Germaine Greer’s house and the McDonalds on the Pampisford roundabout. Which is exactly what this development is all about. No explanation of why this was such a good place to put a new town, or what made this preferable to any other green fields anywhere else in England. 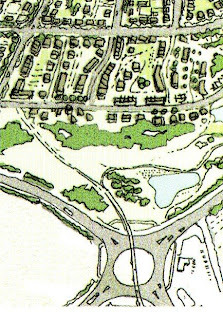 The Pampisford roundabout is an interesting case in point. It’s the bit I have circled in blue, at the northern end of the development, closest to Cambridge. This roundabout is already a noted bottleneck with cars queuing for up to twenty minutes to get through at peak times. And yet the only thing they have even deigned to do to improve matters here is to draw a cycle bridge across the top of it. Talk about greenwash. Can you envisage what it would really be like? It would be a great place for small boys to drop stones onto the stationary traffic below, or for potential suicides to contemplate their fate, cheered on by the appreciative customers of McDonalds. Which, come to think of it, would surely have to be transformed into something more healthy otherwise the eco town residents might be tempted to binge eat. If you look at the plan even more closely, you can see that the entrances and exits to Hanley Grange are by way of five T-junctions onto the existing roads, neither of which is capable of handling the current amount of traffic. 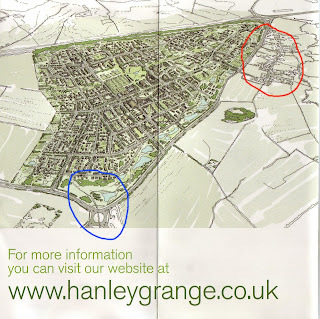 Not even a new roundabout is drawn in, just possibly because it might remind people that the residents at Hanley Grange may choose to have cars, and this would illustrate that the whole idea of building a sustainable community in a green field is a nonsense. Around the back of the village hall, the protest group against Hanley Grange had set up a tent where they were gathering signatures. There I picked up a strong feeling of rural resentment against this sort of central government diktat. Apparently, of the fifteen proposed sites for eco towns, fourteen of them are in Tory constituencies. The only one that isn’t is Rossington near Doncaster which just happens to be in the constituency of Caroline Flint, the Housing Minister. Later this year the 15 sites are due to be pared down to 10: it’ll be interesting to see if Rossington gets through to the next round! “No thanks” I said, “I’ll be happy to take it down the tip next time I’m going there.” I wondered for a moment what hazards might be found in old aerials, and have even been as far as Googling for known aerial toxins, without success so far. Is this some new legilslative requirement or is it just some wheeze by the aerial company to squeeze a bit more money out of the customer? Social housing boss, Sir Bob Kerslake, signalled a retreat from the government’s 3 million new homes by 2020 target, as reported in Building today. No surprises there, you may think, as housebuilding has been hit for six by the economic downturn and it looks as though completions this year will be at their lowest for a long long time, just at the point in time when they should be powering ahead — if those targets were ever to be met. What caught my interest that about this story was not so much that the targets were under review but that Kerslake gave a new reason for the existence of the targets in the first place. He said that it was still vital that the government hit its housebuilding targets in order to prevent the growth of a society of haves and have nots. Up until now, the justification has always been that there is a terrible housing shortage and that young people can’t afford to get on the housing ladder. Now that justification is beginning to look rather thin: if there was such a terrible shortage of housing, why would prices be falling? Now the reasoning seems to have changed to one that sounds more like a method of wealth redistribution. But this is still assuming that home ownership remains a means of becoming wealthy, which is what Thatcher originally espoused all those years ago. If the credit crunch is telling us anything, it’s telling us that the old ways of thinking about home ownership, and in particular the gearing effect of mortgaging yourself to the hilt in order to get rich, are kaput. It’s now rather more likely that, once the dust has settled and house prices have found a floor, we’ll experience many years of what Germany has been seeing ever since reunification – stable house prices. More particularly, the land may hold its value but the house itself becomes a depreciating asset, rather like a car. In which case, the gap between the haves and the have-nots may not be quite as far apart as Kerslake suggests. And the rationale behind building 3m new homes looks even weaker. Having written so glowingly about Varilight, I then went out and bought five. The first one that I tried to fit burst in my hand as I was pushing it into the light fitting. Now maybe I am a big strong ham-fisted bloke (I am) who is naturally a little clumsy (I am), but this has never happened to me with a lightbulb of any description before. Maybe the Varilight isn’t quite as robust as you might hope for. I looked at the packet, which says that the bulbs last 16,000 hours and gave a wry smile. I briefly worried about mercury contamination. Figuring life was short enough already, I then cleared up the mess and put another Varilight in its place, this time handling it a little more gingerly. Thus far, a week later, everything is working fine. My youngest son, Guy, is just doing his GCSEs. He’s got a geography teacher who “is always batting on” about energy saving lightbulbs, chivvying her class to get their parents to fit them everywhere. It’s the sort of topic that doesn’t really excite teenage boys, as you can imagine. They get a lot of chivvying these days. Don’t drink, don’t smoke, don’t take drugs, don’t mug anyone: energy saving bulbs fit into that sort of category. No wonder they are all playing GTA4. But last night I showed my sons the Varilight and lo and behold they were impressed. “Now that is cool,” said eldest, Jack. I was impressed that he was impressed. We were all impressed. You see, the Varilight is a dimmable compact fluorescent, the first that I have seen. By flicking the switch off and on quickly, the bulb comes on full brightness and then after a second or two starts to dim. In fact it goes into a mode where it cycles between full output and around 20% output. If you leave it like this, it carries on changing output indefinitely — this is the feature that the boys found “cool.” When you get to the output you desire, you flick the switch off and on again, and the lamp comes back on at that level and will continue to do so everytime you switch it on again in future, or until you put it back into cycle mode once more. It’s all down to a quick off/on on the switch, a bit like a double click on a mouse. It’s a lightbulb for the wired generation. What’s more, it’s a really good quality light, much warmer than your typical CF bulb, and it’s only slightly larger than a conventional bulb. I’m sold. Made by Doyle & Tratt in Horsham, Sussex, and available online for around £10, it strikes me that Varilight would make an ideal late-Noughties gift. 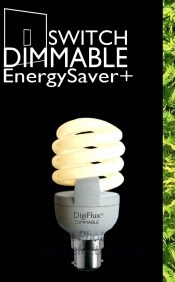 I imagine in two or three years, dimmable CF bulbs will be two-a-penny, but right now they have cachet. One word of caution. Varilight make a version of this lamp that is designed to work with dimmer switches, as well as having both formats available in bayonet or screw-fit. You have to read the website quite carefully so as you are sure which one you are buying. The one I have been testing is known as the YCA20S-B22 - Varilight Switch Dimmable energy saving lamp, Compact Fluorescent Lamp, with Bayonet Fitting, whereas the Dimmer Dimmable ones are known as the YCA20D-B22 - Varilight The NEW Varilight Dimmer Dimmable Energy Saving Lamp with Bayonet Fitting. Not exactly user friendly, is it? And the website isn’t the most elegantly designed beast you will ever come across either, so you may end up feeling that you are not quite sure what it is you are buying. I am really impressed by the Sullivan Report. Living in England, I’d not heard of it before today because it refers to Scotland. But as I’m lecturing in Glasgow this weekend, I have been mugging up on what lies in store for the Scots on the road to zero carbon, aware that the remit of the Code for Sustainable Homes (CSH) doesn’t spread north of the border. 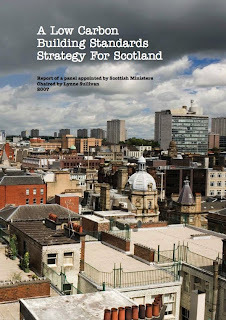 In its place, in August last year, the new SNP government commissioned Lynne Sullivan, Broadway Malyon’s Head of Sustainability, to chair a panel of energy experts to create a roadmap for Scotland. It’s officially called A Low Carbon Building Standards Strategy for Scotland and unlike the CSH, it’s full of common sense and good ideas. For a start, it doesn’t veer off into water saving issues (possibly because Scotland is not and is never likely to be short of water). Nor is there any of that noise about improving ecology, waste management and sustainable drainage. No, the report just sticks to carbon. Like the CSH, there are some roadmap dates for changes in building regulations: in fact the dates, 2010, 2013 and 2016 are identical to the CSH dates. So far so good. But what really caught my eye was that its really realistic about what is achievable and what isn’t. Two points in particular stand out. We do not consider that the industry is yet sufficiently developed to justify mandatory requirements in building regulations for low carbon equipment or to require all buildings to become generators of electricity. The report is suggesting that community-wide schemes, particularly CHP, would be far more effective and that it is expensive and pointless to insist on building specific solutions. Secondly, there is some scepticism about whether to adopt wholesale the PassivHaus standard, as CSH appears to do. Sullivan’s panel had members on it from Austria, Denmark and Norway and their input was listened to and absorbed. In particular, the Austrian delegate expressed concern about wholesale adoption of PassivHaus. Although having many examples of ‘PassivHaus’ (2,500 in total) in his own country, one of our European members was most insistent that you could not impose ‘PassivHaus’ living habits on home owners and occupiers. The main issue associated with ‘PassivHaus’ is that to realise the enhanced energy performance and to avoid mould growth arising from condensation, the occupants must be prepared to adjust their lifestyle to rely solely on mechanical ventilation with heat recovery (MVHR), including frequent changes of filters and the associated running costs. In his country there was significant subsidy for those who elected to build and occupy such houses, but most importantly these people had made the decision themselves and had not been forced to live this way through regulation. This is such an important point and it appears to have been completely missed by DCLG in London who produced the Code for Sustainable Homes. At the moment, England is on course to impose PassivHaus by 2013 and microrenewables by 2016. No one seems to have sat down and asked whether this is sensible, let alone possible. So I award full marks to Lynne Sullivan for putting this report together so quickly and making so many sensible suggestions. And having the courage to point out where Westminster has gone wrong with its vision for low and zero carbon homes. And full marks to the SNP for commissioning it. It’s a shame they don’t run in England: I’d be sorely tempted to vote for them. I have been reading two books this week in the slightly random, chaotic way that I tend to read books these days. Dipping in and out of them and pitching in at bits that look as though they might be interesting. Sometimes just starting where the page happens to fall open. However you read them, they make an interesting contrast. One is Rob Hopkins Transition Handbook, the other is Tim Pullen’s Simply Sustainable Homes. In many ways, you’d think that they’d make a pair, but they don’t. Hopkins is the man responsible for turning Totnes in Devon into a Transition Town and creating the Totnes Pound, a form of LET, for community trading and bartering. He is a dreamer and a thinker and he has lots of jolly good ideas for how Totnes will get by after peak oil, or powerdown as he likes to call it. I am sorry, but I can’t take it or him seriously. It all seems like a bit like back in the 80s when various towns declared themselves Nuclear-Free Zones. There’s lots of Imagineering and a fair bit of philosophical underpinning, but very little that is new or challenging. It’s Schumacher with a peak oil twist. And I don’t mean Michael Schumacher, either. Somehow, I don’t think Michael Schumacher would be impressed. Basically, Hopkins is saying that in order to survive an oil-less future, we should all become hippies. We should live in co-housing, grow organic vegetables, build using cob and straw bale and screw each other’s wives and husbands. Actually, he didn’t suggest that last bit; I added it in because that is what hippies actually did, IIRC, together with taking large amounts of dope and getting into arguments about whose turn it was to cook tonight. You see, I sort of lived that future back in the 1970s and decided it really didn’t work quite as well as its advocates (and there were many) said it would. Down in Totnes, the 1970s never really went away and maybe, just maybe, they made it work for them. And in Stroud too. And maybe Hebden Bridge. But most of us live in places like Chelmsford or Tamworth, or in London suburbs like Streatham. And there the Good Life never caught on at all, and I don’t think it will when the oil runs out either. I’ve never been convinced by these anti-globalisation, localism arguments, and to my mind Hopkins is just serving up more of the same. On the other hand, global trade is a lot harder without cheap oil, but then so is everything else. Are we really going to go back to horse and carts? Contrast it with Tim Pullen’s brief guidebook to building using sustainable materials. I don’t agree with every assertion in Pullen’s book either — I don’t think you’d suffocate if the mechanical ventilation system breaks down — but the meat of it is a simple exposition of how to use, and how to cost natural building materials and renewable energy systems. He’s particularly good on renewable energy, based on his experiences as a consultant in Wales where features like hydro power are more commonplace than in the flatlands of East Anglia where I live. There’s also a useful analysis of natural insulation materials: if you have trouble telling your Pavatex from your Homatherm, it’s all in here. Pullen doesn’t pull his punches and describes what he thinks works and, just as importantly, what doesn’t. The paradoxical thing is that if you really want to prepare for an oil-free future, then Tim Pullen’s Simply Sustainable Homes is a really useful guide to have by your side. Not so Rob Hopkins’ Transition Handbook: it’s a green manifesto for sure, but it won’t get you powered up, fed or housed. Can you tell your Grohe from your Hansgrohe? I have been dimly aware for a long time that there is a very good German manufacturer of showers and taps and had seen them referred to as Grohe. Or was in Hansgrohe? Or maybe both. To tell the truth, I hadn’t thought that much about it until today when I noticed that the Grohe website I went to didn’t look much like the Hansgrohe catalogue I had in my hand. Something amiss on the corporate branding department. Turns out they are two separate companies with a common history. Thanks to Wiki Answers for this slightly confusing explanation. Hans Grohe founded the company. Later the son sold the brand to an American corporation and set up his own company again. This time round he cannot use Hansgrohe, so he used the brand Grohe instead. As for which is better, I have not had the chance to compare them. But based on first touch alone, Grohe taps are somewhat smoother when turning them on/off compared to Hansgrohe, but the price is very much different! Hansgrohe is the original company created by Hans Grohe. His son created Grohe and made Hansgrohe specialise in showers and Grohe in mixers (or faucets). Then Klaus Grohe, current CEO of Hans Grohe took control of the company and Grohe got sold (and has been sold numerous times). Hansgrohe is still owned by the Grohe family, but Klaus's side! The showers and taps by Hansgrohe are the best, no question. If you read this twice, it strikes me that it’s in fact two different accounts of the same events. The writer of §1 and 2 seems to prefer Grohe whilst the writer of §3 seems to be a Hansgrohe supporter.